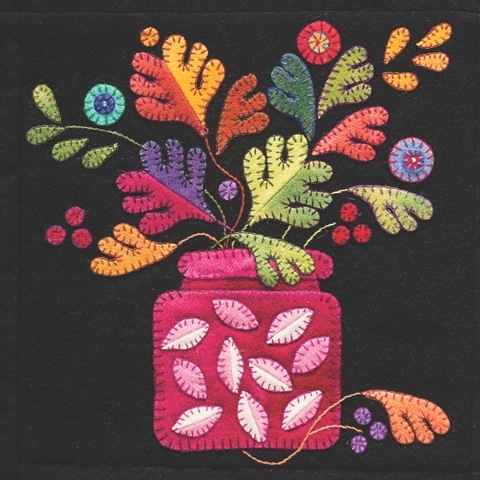 Make a whimsical wool applique quilt with brilliant jewel tone colors. This is a fun project for all skill levels. If you enjoy hand stitching this class is for you. The class will focus on teaching the technique of working with felted wool from pre- paring the applique pieces with freezer paper to choosing contrasting embroidery floss colors for hand stitching to complement each design element and it’s much easier and more forgiving than needle turned applique. And when you’re finished, you’ll have a wonderful wall hanging. This class could be taught as a single class or if it works better as a series of classes. 3 to 4 hours as a single class to teach the techniques or 3 hours for each block if taught as a series. Each student will need table space, a chair and access to an outlet for their iron and a pressing station for every 3 students attending. 1.Cut out the background square for block 1. 2.Trace and number block 1 on vinyl with a sharpie pen. 3. From the original design, trace each element of the design onto freezer paper and number it the same as the numbers on the vinyl. 4.Cut out each numbered shape from the freezer paper and iron it to the color wool you want it to be. 5.Cut the freezer paper and wool together on the line. 6.Place the cut piece on the wool square under the overlay where indicated. 7.Staple that piece to the square. Continue until each shape is in place. 8.After all the pieces are stapled in place, remove the overlay and trace around each raw edge of wool with Fray Check (let dry). 9.Stitch each piece to the background with 1 strand of matching embroidery floss, then remove staple. 10.Blanket stitch around edges with 2 strands of contrasting embroidery floss. 11.Use soap sliver or white pencil to mark vines or flower stems as needed.